This easily accessible reference volume offers a comprehensive guide to this rapidly expanding field. 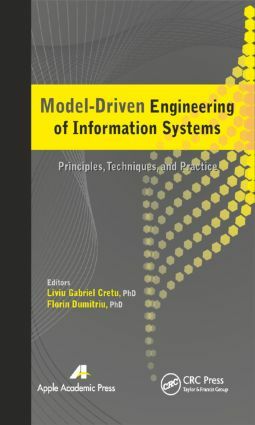 Edited by experienced writers with experience in both research and the practice of software engineering, Model-Driven Engineering of Information Systems: Principles, Techniques and Practice is an authoritative and easy-to-use reference, ideal for both researchers in the field and students who wish to gain an overview to this important field of study. Dr. Liviu Gabriel Cretu is an applications architect at European Commission, D.G. Informatics, Unit B-Information Systems and Interoperability Solutions and a lecturer and research director at the Alexandru Ioan Cuza University, Iasi, Romania. He is a researcher, developer, and author, having published numerous peer-reviewed articles in the fields of semantic web enterprise architecture, model-driven engineering, event-driven SOA, business rules driven SOA, and business process management. He received his PhD in business information systems from the Universitatea Alexandru Ioan Cuza, Romania. Dr. Florin Dumitriu is a professor in the Department of Economics and Business Administration at the Alexandru Ioan Cuza University in Iasi, Romania. He is the author of a number of articles published in numerous international journals.